Anne Tyler’s The Accidental Tourist, pulls you into its plot quite sneakily! A funny and light-hearted tone couches serious situations, without getting overly melodramatic. 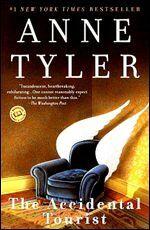 This is the first time I read or even heard of Anne Tyler. I picked up this book for three reasons. The first reason why the book caught my attention was that the author and I share a common first name. (Yes I can be petty like that ;-)) The second was that I am trying to read more women writers nowadays and the third being, the blurb describing the protagonist as someone who revels in routine, sounded quite suspiciously like me. Therefore, I approached the book without any expectations and I must say that I am pleasantly surprised. The story revolves around Macon whose wife, Sarah decides to end their long marriage. According to her it was a long-suffering marriage, but the tragic death of their son happened to be the last straw. So Macon is left to fend for himself along with their cat and dog. It so happens that his dog turns out to be too much to handle and he hires a totally whacko lady named Muriel, who seems eccentric at best. We are also introduced to a host of other characters like Macon’s exuberant boss, Julian, his old-maid sister, Rose and brothers, neighbours etc, Muriel’s sickly son etc. Macon writes guide books for business travelers, titled ‘The Accidental Tourist in ----- (whichever city)”. In many ways Macon’s life is much like his books which are meant for people who travel out of compulsion and don’t really want to get out of their comfort zones. Almost everything significant that has happened in his life, including his career and marriage, were not out of any active choice that he makes. He comes across all the major events or turning points in his life quite by accident, passively being swept into it. And when the time comes for him, to finally take a stand and exercise his choice, does he do it? I enjoyed Anne Tyler’s writing style. Funny and light, yet addressing important questions and emotions. She is pretty descriptive, especially when it comes to the dog’s antics, which I found particularly endearing. As the story unfolds, some of it is quite predictable, while the rest is intriguing. Towards the end, I was silently hoping for it to go down the path that my heart was rooting for – and I cheered when it did, however impractical it might be to pragmatists! On the whole, TheAccidental Tourist was a refreshing read and Anne Tyler has earned herself a fan! It was only while writing this review that I looked her up and I learnt that she is a Pulitzer Prize winning writer and what's more? The Accidental Tourist has also been made into a movie! Respect. I shall definitely be looking out for more of her books!